Autocruise has added welcome clarity by dividing its 2009 line-up into three distinct ranges -the Star, Star Plus and Driving ranges. The line-up kicks off with the Star range including the Stargazer, Starspirit and Starblazer. The Starfire has been dropped for 2009. These entry-level models have LED interior lighting for longer leisure battery life, new positive locking cupboard handles, domestic-style bathroom doors, new-style curved doors on fridges of at least 112 litres capacity, and space heating that can be used while you drive – features that are now common to all Autocruise coachbuilts, in fact. Two brand new layouts also feature as part of the Star range. The Sportstar is a direct rival for the Hymer Van, Hobby Van, Knaus Van TI and the numerous other European ‘Van’ low-profiles that will be available next season. Its sub-six-metre body includes a garage, of course, but the bed above folds back to the size of a single during the day for extra floor and kitchen space. It’s the only model that comes with the lowly 100bhp engine as standard, so it’s worth budgeting for the essential 130bhp upgrade when comparing prices! 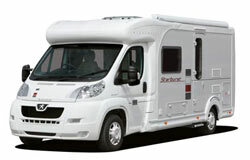 The other Star range debutante is the Starquest: a family model with a front pullman dinette and a largish rear lounge. The revised Starblazer (garage model) completes the range. 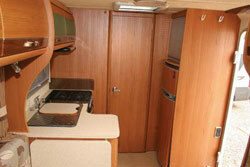 This model loses its stepped roofline and gains half-dinette seating to become more family-friendly. In the Star Plus range, familiar Starburst, Stardream and Startrail all have AL-KO chassis and all get improved equipment details. The flagship Driving range including the Autocruise Gleneagle – which we reviewed last month, plus the Augusta and Oakmont, get the addition of cab air-con, cruise control, alloy wheels, awning, Skyview overcab sunroof (except Oakmont), fresh and waste water tank heaters, 15-inch flatscreen TV and portable sat nav as standard. The fixed single bed Augusta also gets wider beds and a revised layout with a re-designed kitchen that makes better use of the space, and now also includes a 175-litre fridge/freezer. The Augusta and Gleneagle are the true pinnacle of Autocruise motorhoming and both now stand out as superbly appointed luxury motorhomes. 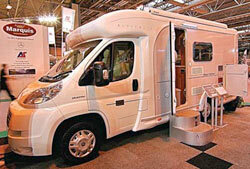 A raft of new models and increased specification add customer appeal. Havea Ato cruise Star Fire, would like to know the recomende running weights, and tyre pressures, cant find any info in the hand book. I’ll speak to Swift and get back to you. I’ve spoken to Swift. They’ve suggested you visit http://www.swift-talk.co.uk to speak to their Technical staff.